As a beginning to a canal cruise, it wasn’t very impressive. We had one or two jobs to do on Sunday before we could leave. The first and most important, although Sally may disagree, was to finish off the newsletter. I made an early start to get it out of the way so that we could begin our holiday and had it finished by 9am. Then we had to sort out my internet connectivity problem. As I’ve mentioned in previous weeks, my Three mobile broadband problem has been a bit hit and miss recently. After two years of very good service my dongle stopped working. The dongle was strapped to a four feet long wooden mast on the cabin roof. While static the hinged pole was vertical to give the dongle a fighting chance of receiving a signal at the marina where phone and mobile broadband signals are normally weak at best. The dongle was attached to my laptop via a five metre USB extension cable fed through a roof vent and up to the top of the mast. A couple of months ago the dongle died so, after many long and interesting conversations to deepest, darkest India, I was sent another dongle free of charge. The dongle, I was reliably informed by the enthusiastic technical services guy, used the latest technology to achieve wider coverage and faster download speeds. Unfortunately, what he didn’t tell me, what he probably didn’t realise, was that the dongle wouldn’t work with my USB extension cable. It worked very well indeed plugged into my laptop providing I sat on the front deck with my head bent at an unnatural angle to avoid the cratch cover. Obviously I couldn’t spend hours at a time working like this so I needed to find a solution. I did some research on the interweb. The solution appeared to be an “active” USB connection. Many frustrated dongle users claimed that it cured the connectivity problem. I ordered one but, alas, it didn’t work for me. I didn’t fancy calling Three’s technical support line. The thought of another couple of hours spent on the phone to well meaning but script driven operators five thousand miles way filled me with dread. I decided to visit a Three store instead to see if they could offer an effective solution. My visit to the Leamington Spa shop was brief but very productive. The store manager was knowledgeable and very vocal about the inefficiency of my current setup. I couldn’t interrupt his monologue for long enough to tell him that the MiFi unit wasn’t available when I took my mobile broadband contract out nearly two years ago or that it was his particular store I used. I asked him how the MiFi could get a signal if it was inside the boat. He told me that the solution was simple. All I had to do was Velcro it to a window. I was sceptical but desperate, so I bought one for £49.99. The MiFi unit, smaller than a pack of cigarettes, is wonderful. It worked perfectly at the marina where many devices don’t work at all, so I had high hopes for it out on the cut. We picked up some fresh food on the way back to the boat, realising that large supermarkets are few and far between between on the route to Market Harborough. We eventually left the marina at 1pm, bathed in early summer sunshine and with high hopes for the fortnight ahead. We didn’t get very far. Within an hour we were nearing the mid point between Calcutt and Braunston. There are some very tranquil spots to moor near Flecknoe. We couldn’t resist stopping for the day to enjoy the fine weather. By 5pm Sally baked a spicy fish pie which we enjoyed sitting on the towpath in the early evening sun. It was a very relaxing start to a lazy two week cruise. The following day wasn’t so relaxing. Neither of us like moorings close to roads or within hearing of too much traffic noise so the first reasonably quiet mooring opportunity was somewhere around Yelvertoft. Sally wanted to go to Midland Chandlers at Braunston on the way “just to look around” so we popped in to the chandlers while we were topping up our water. “Just to look around” meant homing in on the fridges as soon as we walked through the door. Our fridge came with the boat when I moved on board and is now looking a little the worse for wear. The plastic hinges on the freezer compartment door have broken so the door won’t stay in place. Does that mean that the fridge is working harder than it should, and draining the batteries more than it should, to try and keep the freezer compartment frozen? I don’t know, but I do know that we can’t use it to freeze stuff. Anyway, it’s not 100% functional and it’s starting to look scruffy so it’s next home will be a skip. Twelve volt fridges don’t come cheap though. We won’t get much change out of £500. We left without the fridge but with a couple of fenders, a spare mooring rope and a wire brush for removing the crud from the chimney collar. After a quick about face at the junction by reversing up one side of the triangle and moving forward along another, we were on our way again. Sally has been looking forward to the cruise for months. She doesn’t get as much exercise as she feels she needs so she couldn’t wait to get to grips with the locks. She certainly had plenty of exercise at the bottom lock of the Braunston flight. She couldn’t raise the paddle an inch. The lock keeper came to help her and struggled himself. The elderly chap’s determination made up for his slight frame though and we were soon on our way. In the third lock we stood chatting to a couple waiting to come down the lock as we waited for our lock to fill when we were joined by a red faced and stressed looking lycra clad lady peddling her folding bike furiously between the locks. She threw her bike on the ground and jogged over to where we stood. Without introducing herself she began to offer advice we didn’t particularly want. “Did you know that if you open all the gate and the ground paddles you can fill up the lock twice as quickly? Did you know that if all of us push on this gate as hard as we can, we’ll be able to open it a few seconds early? Did you know that I’m on the verge of a nervous breakdown, I don’t know how to relax, and I’m not enjoying my first narrowboat experience at all?” She may not have said the last bit entirely as I’ve written it, or even at all, but I think that’s the way she probably felt. We let Mrs. Stressy Knickers pass us in the next pound. Sally and I weren’t in a rush so didn’t want to feel under pressure to pass through the flight at the speed of light. As her hire boat passed us I heard her imploring her husband to get through the tunnel as soon as possible while she hyperventilated and looked wildly around her. I didn’t feel that she was going to have a particularly relaxing trip. We stopped briefly just before Braunston tunnel to let the dogs out for a wee and to make sure that we drew back the curtains and turned all the lights on in the boat, and made sure that we had a powerful torch handy on the back of the boat. Changing James’ headlight is on my To Do list. I’m sure the one we have at the moment is an old bicycle lamp. It’s just about capable of illuminating the palm of my hand if I hold it about six inches away but fails miserably to show us the way through dark and dismal tunnels. A sharp left hand turn at Norton junction and we were on the Grand Union Leicester line. Half an hour later we were squeezing through Watford gap alongside the a busy railway, the hectic A5 and the frantic M1. I told him I would set the lock for him so that he could come in. I had him safely in the lock and almost ready to exit before the lock keeper caught me and gave me the best telling off I’ve had since I left school in 1976. I hadn’t seen the clearly written A board instructing all boats to see the lock keeper before entering a lock. I apologised, he booked me in and strode off. Minutes later, he told the hire boat in front of me to go up the four staircase lock, but told me that I had to wait until the boat in front of me had reached the top, and two boats waiting at the top had come down. I didn’t understand why I couldn’t have followed the boat in front of me. I assumed it was my punishment for not booking in when I arrived. The “punishment” cost us an hour sitting in the pound beneath the staircase listening to the roar of traffic on the motorway. By the time we reached the top of the flight it was late afternoon. We dashed through Crick tunnel and where thankful that we keep waterproof jackets within easy reach. Crick tunnel is very wet, more streams than drips from the roof. Out of the tunnel, past Crick marina, thoughts of stopping for a quick walk up Crack’s hill to exercise the dogs immediately discounted because of the dozens of sheep dotting the hillside and onward towards Yelvertoft marina. We reached Yelvertoft at 7pm. The intention had been to reach bridge 28 and the quiet and pretty moorings we had been told about. By that time of the day though my heart wasn’t in it. We stopped for the night a hundred metres south of the marina entrance. It wasn’t as pretty a view as I would have liked but it was a peaceful spot and a very welcome rest after a ten hour cruise. The following morning we wandered into Yelvertoft to visit the butcher, the post office/village shop and the Knightly Arms. The pub visit was to use the toilet. Our cassette toilet is reserved almost exclusively for liquids. Wherever possible we use toilets attached to a mains water supply for solids. You get a much better flush where mains water pressure is available! We always have a drink in exchange for using the facilities. We sat in the beautifully kept pub garden in the shade of a towering tree with peeling bark. I thought it was a eucalyptus. When we took our glasses back to the bar on the way out we asked the shaven-headed silk scarf wearing barmaid what it was. “How would I know? I’ve never been as far as the garden!”, she exclaimed as she gave me the kind of look normally reserved for small children asking annoying questions. Next we visited the village’s high end Italian delicatessen, Squisito. Exquisite by name maybe, but certainly not by nature. We walked though the open front door into the brightly lit shop interior. After a couple of minutes one of the two men hunched over a slab of meat on a table behind the counter lifted his head to acknowledge our presence before telling us, rather surprisingly, that Tuesday is a training day and one which the shop is closed to the public. We didn’t fare much better at the village general store. The shopkeeper seemed reluctant to stop working on his laptop long enough to charge us for the pack of bacon and two bottles of beer we wanted from him. We began a very short day’s cruising mid afternoon. We pulled over at the water point at Yelvertoft Wharf to top up but weren’t quite quick enough to get there before a BW working boat. They didn’t delay us for longer than a minute though. The “water tank” which needed filling was a large kettle. What we did and where we went after that is a complete mystery to both Sally and to me. I’m writing this on Saturday morning but neither of us can remember where we moored on Tuesday night or what we did when we got there. We’ve just spent half an hour studying our Pearson’s guide. We know where we were Monday night, Tuesday during the day and everything which has happened since then, but Tuesday night was a mystery. All I can say is that we moored somewhere between Yelvertoft Wharf and Welford Junction and that we probably enjoyed the experience. Other than that, I’m at a loss. Sorry! After our missing night on the cut we travelled what was probably quite a short distance to Welford Junction then along the Welford arm for half an hour before stopping on the tree shaded visitor moorings just before the marina. This leg of the journey was short but memorable. Three times on the cruise up until then we saw a solitary grey heron standing motionless staring intently at the water. 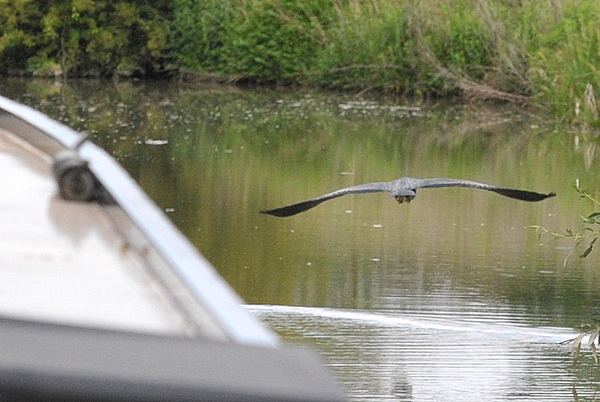 As the boat approached, the bird would spread its wings, lift effortlessly into the air and flap slowly along the waterway to another spot a few hundred metres ahead of us. I took a few photo’s one handed as I steered but the bird was too far away. I was determined to get a decent photo so I asked Sally to take over at the helm while I lay on the roof at the front of the cabin. The combination of me looking through the camera’s viewfinder for the bird, Sally scanning either bank as we progressed, and neither of us watching where the boat was going didn’t work very well. Sally spotted the bird first, took her hand off the tiller to point enthusiastically to where it was hiding behind a bush, and promptly buried the boat’s bow into the undergrowth as she veered off the main channel. Of course the sound of hawthorn scraping like nails across a blackboard along the cabin side caused the heron to fly off again. After returning to the centre of the canal, we resumed our search. Eagle eyed Sally was the first to spot a blue/grey flash in the undergrowth. We weren’t going to miss it this time. Sally slowed the boat to just over tickover, I zoomed my telephoto lens in on the spot, and nearly fell off the boat laughing. At Welford we had a quick walk around the village before returning to the Wharf Inn for lunch. The pub was empty at 2pm apart from one retired couple eating and a group of five well lubricated gents in their early seventies taking a slightly incoherent stroll down memory lane. After a very acceptable beer battered cod and chips we turned the boat in the winding hole at the marina entrance and headed back towards the junction. I managed to pick up something on the propeller when I slowed to pick up Sally after the lock. The billowing smoke from the exhaust and reduction in power alerted me to the problem, but a quick and enthusiastic burst in reverse cleared the obstruction. Half an hour later we were back at the junction. It was such a quiet spot far, far away from roads, houses or even walkers and cyclists that we couldn’t resist staying the night. I’m pleased we stopped when I did. Within minutes of securing the boat the heavens opened. The rain was heavy and continuous for the rest of the evening and the temperature dropped enough to warrant lighting the stove. We’ve had our fair share of overcast skies and intermittent rain on this trip. The rain doesn’t really stop us from enjoying the cruising. We both have a decent set of waterproofs so even in heavy rain we carry on cruising regardless but dull days mean that we have to run the engine to top up the battery bank for much longer than we do on sunny days. When we are away from the marina I realise how much effort is needed to keep the battery bank fully charged when the boat’s off grid. When we’re on our mooring we are plugged in to the shore supply so our batteries are always at 100% regardless of the appliances we have connected to the mains. We should reduce our power use. We often have chargers plugged in to live sockets but not charging any devices. We regularly use and 1800w coffee machine, an equally power hungry vacuum cleaner, a hair dryer and straighteners (Sally sometimes uses these too) and an iron. The twin tub washing machine isn’t particularly high powered but it’s used a lot. It’s not unusual for Sally to spend most of the day using it. The wash tub is 120w. The spin tub is 180w. I’ve only realised just how much our various devices drain the battery bank since I’ve had our Smartgauge battery monitor fitted. Sally’s had a couple of halfhearted sessions with the washing machine. I can keep the batteries at the same level providing I run the engine when she’s using it but I struggle to keep up with our most power hungry appliance, the fridge. The fridge is a constant and significant drain on the battery bank. Over the last week we’ve had the inverter running all day. It’s a bad habit to get into and one which we need to break if we want to conserve power but at the moment it’s what we do. The battery bank is fully charged by the time we moor for the day either via the engine running or the solar panels. By the time we go to bed, usually at about 10pm, the battery bank capacity has dropped to about 90%. I turn the inverter off at night so only the 12v lights, water pump, shower pump and fridge have power. All lights are off and the pumps aren’t used overnight but the fridge is on constantly. I get up at 6am at the latest. Overnight, with just the fridge running, the battery bank capacity has dropped to 75%. The missing freezer compartment door appears to be costing us a lot of money in engine running time to replenish the power it’s used. We will replace the fridge as soon as we get back. I’ll be very interested to see what difference a new fridge makes to your power consumption. The following day, Thursday, we decided to stay at the junction. The torrential rain had stopped, the clouds had cleared and the forecast was for a warm and sunny day. We needed water though and we needed to empty the toilet cassette. We had also just about run out of food so we popped back into Welford to feed both the boat and ourselves. Back in the pub, the same group of elderly revellers were propping up the bar. After an excellent Cajun chicken and chips we took the boat back to the junction and enjoyed an early afternoon and evening in the sun. By midday on Friday we were at Foxton Top Lock. We tied the boat up on the visitor moorings then walked down the flight to find one of the three lock keepers on duty and find out what the procedure was. We were told to book in as soon as we were ready to descend. As the boat was devoid of any fresh food we decided to have lunch at the Foxton Locks Inn before tackling the flight. The lock flight and the pub are very popular with tourists. By the time we ordered our food at 1pm most of the two dozen tables outside next to the junction were full. It was the perfect spot and the perfect day to enjoy an al fresco meal. We couldn’t hang about though, we had some showing off to do. There were about fifty tourists standing next to the the locks photographing the boats passing through. I haven’t been able to persuade Sally to take the boat through a lock yet, so she was on paddle duty. The watchers didn’t realise, or didn’t care, that they were standing in the way much of the time so Sally had to ask them repeatedly to get out of the way of the paddles or off the gates when she was trying to open them. Other than that, and the shock of paying £6 for two ice creams as we waited at the top of the flight for our turn, the passage was fairly quick and uneventful as was the immediate right turn onto the Market Harborough arm through the pedestrian swing bridge. The pedestrian swing bridge passage was uneventful. The road swing bridge ten minutes later was not. Sally didn’t fancy manhandling a 20′ length of road out of the way of the boat so she reluctantly agreed to take the boat through while I opened the bridge. Sally steers the boat quite often but up to that point she hadn’t started it from rest or brought it to a halt. Consequently, and understandably, she made one or two mistakes, which caused one or two more and resulted in the bow being embedded in the undergrowth on the offside, much to her embarrassment and the amusement of the five pedestrians waiting to cross the bridge. After a little careful coaching she had the boat past the bridge so I could close it and hop back onto the boat from the towpath. The cruise from the bottom of Foxton locks to Market Harborough takes about two hours. There are very few decent moorings along the way. Most of the towpath is obscured by long grass and reeds but we found a short stretch of deep water and Armco rail exposed to the early evening sun to stop for the night. The canal bank was overgrown but five minutes work with the pair of garden shears we keep on board soon sorted the problem out. We settled down for a couple of hours reading in the sun interrupted only by the occasional cyclist and the distant roar of the A6. We woke to rain again on Saturday morning but by midday the sun was out and we were on our way again. By 1pm we were in Market Harborough basin, moored next to the Elsan point for long enough to empty our cassette and have a chat with South African continuous cruiser and ex Calcutt resident Monique (Mons) McNaught on her boat Pern. The subject of the swing road bridge near Foxton came up. I asked her how she managed it on her own. She has an interesting but very effective technique. If there are no other boaters about to help her out, and there’s nowhere for her to tie up to on the offside where the bridge controls are, she ties her boat across the canal so, once the bridge is open, she can hop back onto the boat, take it through the gap, tie it across the canal again, then close the bridge. Crude, but effective! We walked half a mile from the basin into the town centre to stock up with essentials from the Tesco Metro, stopped at Subway for a steak sandwich, then trudged back to the boat with our shopping. I’ll be OK once I get the circulation back in my fingers. We stopped for the evening close to our previous night’s mooring, enjoyed a very large bowl of fresh fruit salad, meringue and double and settled down to watch a DVD as we had no television signal. And that’s where we are now. We’ll stay here until I send the newsletter out later today, then we’ll set off again. I don’t quite know where yet. I don’t think we’ll head back up the Foxton flight yet. We’ll probably explore the Leicester line towards Leicester for another day or two before a very leisurely return to Calcutt.